Back in 2013 I read a story about a teenage girl in California who was declared brain dead after a routine tonsillectomy went wrong. There was a lot of talk at the time about the legal and moral implications. I’m not a lawyer, so I can’t weigh in on this, but I am a mother, and my first thought when I read this story was for the girl’s mother and the heartbreak she must’ve been feeling. Losing your child is every parent’s worst nightmare, and I imagined myself in her circumstances. Being the person I am, I started asking myself what if? What if the teenage girl had been pregnant? Would that be a comfort or a curse to her mother? What if the mother had suffered her own tragedies? What if she was a single parent? What if she thought something more sinister had happened? What if she’d been murdered, but nobody would listen to her? I started building a character who I loved, put her in the most difficult situation—her daughter being declared brain dead—and pushed her even further; I had her daughter be pregnant. And thus was born The Night Olivia Fell. I like to think that writing the book was really easy and that every word flowed like water. But that isn’t entirely true. I felt so many emotions while I was writing this book that sometimes I couldn’t even get words onto the page. There were many days when I cried right alongside Abi, my protagonist, as I felt her pain. I spent a lot of time sitting on a chair in my back yard that summer, just staring into space as chaotic thoughts whirled around my head. Then, terrified I wasn’t getting the words just right, I’d have my husband read what I’d written that day. I wanted the book to be suspenseful, but emotional, sensitive but profoundly poignant. I didn’t have the luxury of writing retreats or a group of writing friends, and I knew my summer off work was coming to an end soon (I was returning to work in September), so I was stressed about that. But I finished the bulk of the novel before I went back to work, and few months later, after many late nights and long weekends of editing and revising, it was complete. Many people think that authors get a single phone call that changes their lives. The reality couldn’t be further from that. The process is s-l-o-w and requires a skin as thick as terra cotta. You literally just live your life, raise your kids, go to work, and write along the way. And when you’re rejected, you keep on writing. I started writing The Night Olivia Fell in summer 2015. It will be published in January 2019. So it was by no means a quick process. Once I’d completed my novel I had to find an agent. Carly Watters, P.S. Literary Agency, was one of five agents I’d queried, and my top pick, so when she emailed asking if we could have a chat I was dizzy with excitement. She offered to represent me and as soon as I got off the phone, my husband and I popped open a bottle of champagne, even though it was only a Monday night. There were loads of edits to do before Carly could submit to publishers. I was working full time as a copywriter at the time, so time was sparse—basically evenings after my kids went to bed and weekends. My poor husband was basically left to do everything as I constantly disappeared upstairs to write during every spare second I could find. I was flat out for months, but finally it was ready to submit to publishers. Of course, once Carly submitted we had to wait for editors to read it, then to pitch to their team and get approval for budget. We had a few passes, and I was starting to feel upset and discouraged when Carly emailed asking if I was able to call her. I was working from home that day, so I Skyped her, my hands shaking and adrenaline making me feel weak. It turned out we had not just one, but two offers! I signed with Kate Dresser at Gallery Books, an imprint of Simon and Schuster, because of her enthusiasm and vision for my book. Needless to say, my husband and I popped a bottle of champagne to celebrate that day, too. There are so many rounds of edits involved in publishing. It honestly really surprised me. There were all of my edits, edits from a course I did, edits for Carly, edits for Kate, edits for the copy-editor, first pass edits, second pass edits, and I’m sure more to come. Everybody was so supportive and so enthusiastic, it made the process really fun. Writing may feel like a lonely endeavor, but publishing is definitely a team sport! I may get another round of edits, then there is the book cover and soon we’ll have the ARCs (Advanced Reader Copies), which are early copies sent out to bloggers, reviewers, booksellers, and other authors to get a bit of hype and some quotes before publication. I can’t wait to get these and start giving them to people, but I’m also a bit breathless with fear. It’s literally sending my words out for people to read! I hope everybody loves my story as much as I loved writing it, but even if people don’t love it, I hope they feel something, because that’s what a book is meant to do, right? We all want to feel something. The fabulous marketing and publicity team at Simon and Schuster will be working in conjunction with Crystal Patriarche and BookSparks to promote The Night Olivia Fell. They represent some of my favorite books and authors, including Behind Closed Doors, BA Paris; Somewhere Out There, Amy Hatvany; Good Me Bad Me, Ali Land; Say Goodbye for Now, Catherine Ryan Hyde; The Kept Woman, Karin Slaughter; The Great Alone, Kristin Hannah; Truly, Madly, Guiltily, Liane Moriarty. I’m so excited to begin work with this amazing team, and I cannot wait for readers to begin reading The Night Olivia Fell! 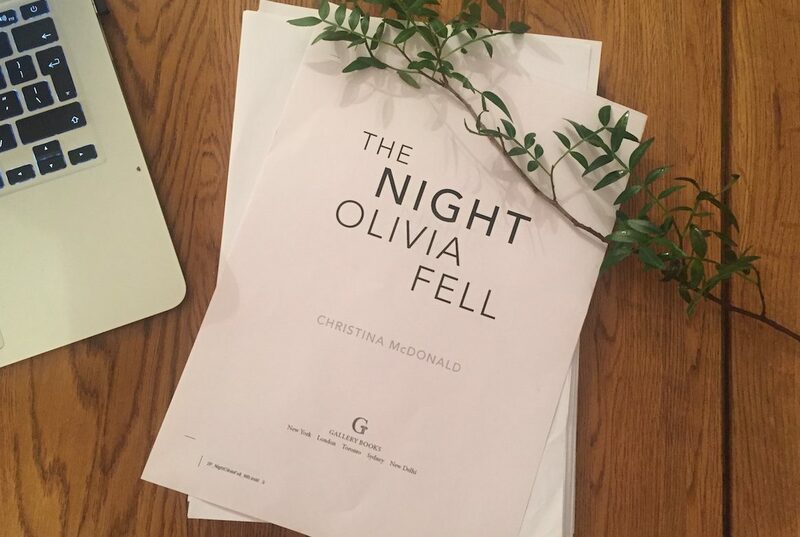 The Night Olivia Fell will be available to buy from Simon and Schuster in January 2019. Christina, please accept my apology on getting the name of your book wrong in my previous comment.